Nothing says spring and summer like a shortened boot. 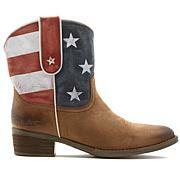 This beautiful style is festival ready and provides all the beautiful quality you want in an heirloom find: genuine leather with leathered details. Sport it with a flirty lace frock, denim shorts and all your light, warm-weather wardrobe pieces. 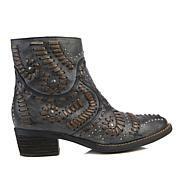 These Sheryl Crow Americana boots are so unique & comfortable. I ordered my usual size 6.5 & they fit perfectly! 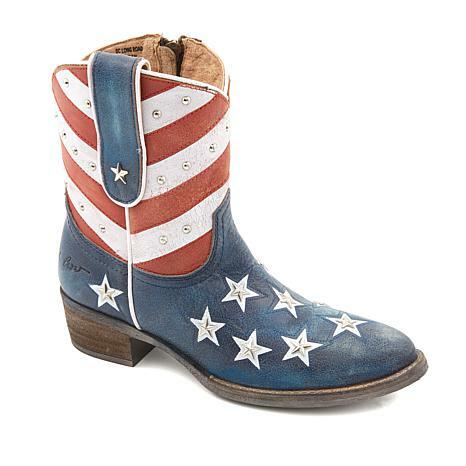 If you were to look for a pair of boots like these at a country western boot store, I'm sure they would be priced at hundreds of dollars. 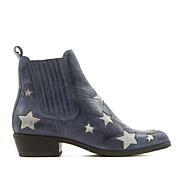 LOVE these boots!! Love this novelty book look but these are really well made and very comfortable. Love the side zipper for ease of entry. I wear an 8 -- it is true to size. I could wear a thin sock in it if I wanted to. They fit true to size. It's nice to have the zipper but I don't really need to use it. The heel is the perfect height for me and not heavy/clunky. I was pleasantly surprised by the metal 3 dimensional stars. I thought they were simply white. The boot is short enough to wear in our Texas heat. 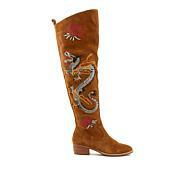 (I got the TX boots last year) *If you have wide feet you may not be able to wear these.